When researching online course platform options, you'll likely come across Kajabi. It's been around for a while and has many big names like James Wedmore and Amy Porterfield using it. It's the platform I use it myself after trying out all the different options. 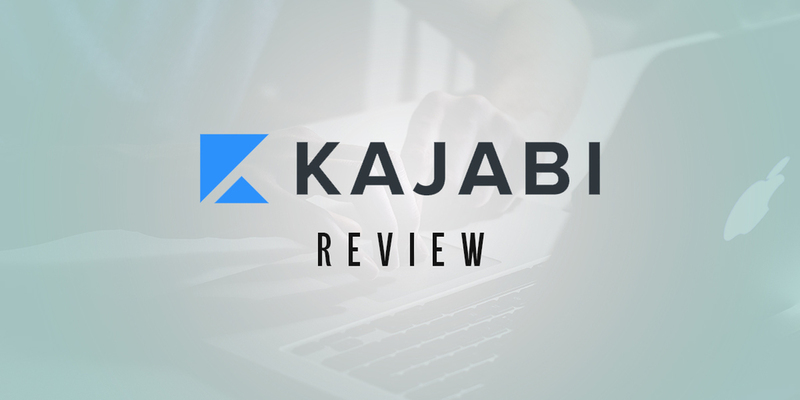 In this in-depth Kajabi review, I’ll take a deep dive look at it's many features and discuss why I think it's the most complete online course platform out there today. Kajabi was founded by Kenny Rueter and Travis Rosser. It is a very powerful software tool for all those who want to monetise their knowledge by creating and selling digital products like online courses and membership programs. Kajabi has an extensive set of features (discussed more below) and aside from creating online courses it can also be used for creating marketing emails, different types of membership sites, checkout pages, landing pages and so on. In fact, you can use it to create your entire website and manage your whole online platform, including your email list. Kajabi will allow you to offer all sorts of payment options and automated marketing tools and processes on your site. All of this in just one app. This is what sets it apart from other options like Teachable or Thinkific which are lacking in the ability to create your own website and run complex marketing campaigns. Since Kajabi is an all-in-one, stand-alone platform, you can have everything you need for your online marketing business in one place. It features a convenient dashboard from which you can create and control your sites. Before we delve deeper into the key features, keep in mind that you need to start by completing a Kajabi profile. This is where you will be spending most of your time as a course creator and online course business owner. The user interface is very intuitive and easy to use as it comes in the form of a nicely designed dashboard. Everything is well organised, with 4 main sections you can access from the left side menu or you can use the search bar at the top at any time to quickly jump to whatever you need. 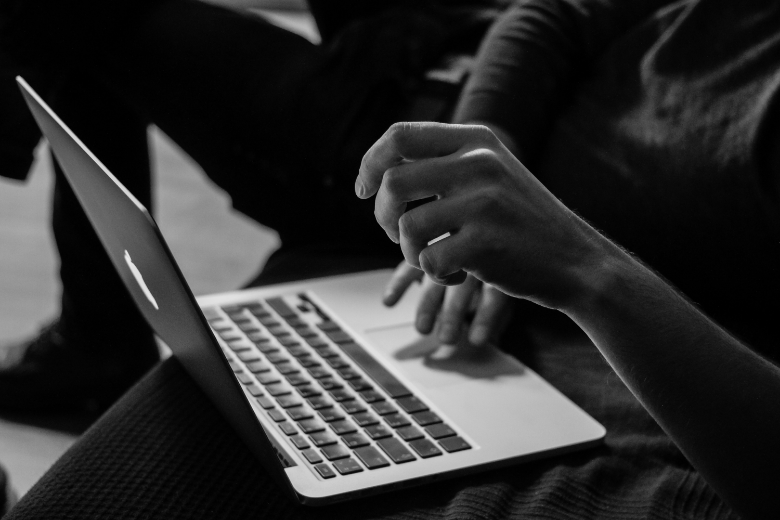 It's easy to navigate between different features of the platform, and if you get stuck at any point you can just use the live chat support for help. If you’ve used WordPress before, you will have no problem using Kajabi and you won't have to worry about updating plugins either! Kajabi comes pre-loaded with 11 different themes to make your own site and courses. They are all beautifully designed and compared to any other online course platform they are light years ahead in helping you create a visually appealing online course website. Obviously compared to the full functionality of WordPress it's not as easy to adjust them and make them look exactly as you want, but you can change images, text, colours and move different elements around to get it to at least 90% of how most people would like (and there’s no messing about with code!). ajabi comes pre-loaded with around 70 selected fonts, and you can use the colour picker to incorporate the colour palette of your own brand, which is another helpful feature to help you create a unique brand. It goes without saying that you can preview your site in both desktop and mobile to allow you to make adjustments for one or both. Your site needs to look good for all users, or you risk losing precious customers. All the pre-loaded themes are mobile responsive, so once again, there is no need to override that with CSS or HTML. All the themes come with opt-in forms, so once again you don’t have to rely on your coding skills. These forms are very easy to set up, incorporate into email marketing platforms and add onto your website. The blogging platform is the part of Kajabi that I like the least. If you compare it to blogging platforms such as WordPress, Kajabi simply can’t deliver in terms of customisation and functionalities. Kajabi’s biggest issue is its images. There is no dedicated area where you can keep all your uploaded pictures, which means if you want to use pictures from your previous posts, you are going to have to upload them again. You can only use 15 images in the “recently uploaded images” area. Also, if you insist on good SEO tools, keep in mind that these settings are rather minimal. You can only specify the title, the meta description and the image for social media sharing. If you like tagging your posts, there is no list of tags you’ve used earlier. This means that the only way you can handle this is to memorise them. 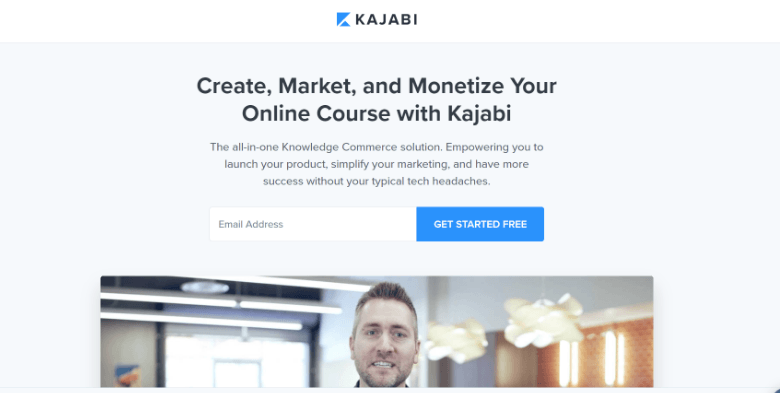 If you already have a blog or website that you use to publish free content on, I'd recommend continuing to use that and just use Kajabi for hosting your courses and some of your marketing. This is another great aspect of Kajabi. You can easily create a community for your website members, including the members of your team. Among the other goodies, you will probably be delighted with the built-in Wistia service for video streaming. Keep in mind that this service costs $99 each month when purchased as a stand-alone item. Also, you will receive notifications for every action on the part of your members, such as comments and replies. Drip schedules for any lessons or courses can be easily implemented and controlled in many ways. Any type of content can easily be imported from your computer, Google Drive or Dropbox accounts, which is another excellent tool for building a strong membership on your site. Creating categories and lessons is fairly easy. You can do this by using a simple drag-and-drop editor. Once you start selling your courses, you can easily track and monitor the progress of your students, as is the case with most other knowledge commerce platforms out there. It is good to know that Kajabi supports integrations with most big name email marketing services such as MailChimp, Aweber, Drip, ConvertKit, and Active Campaign. You can also connect it to Google Analytics and add Facebook Ad tracking pixels, or connect to your accounting software. Amongst a total of 500 possible intergations available to you, chances are that if you want to integrate a piece of software you already use, it's possible! Included in Kajabi is a rather powerful landing page builder which comes with 24 pre-defined templates. You can build a page from scratch, as with any other page in Kajabi. You can also add multiple options such as sales pages, webinar registrations and opt-ins. 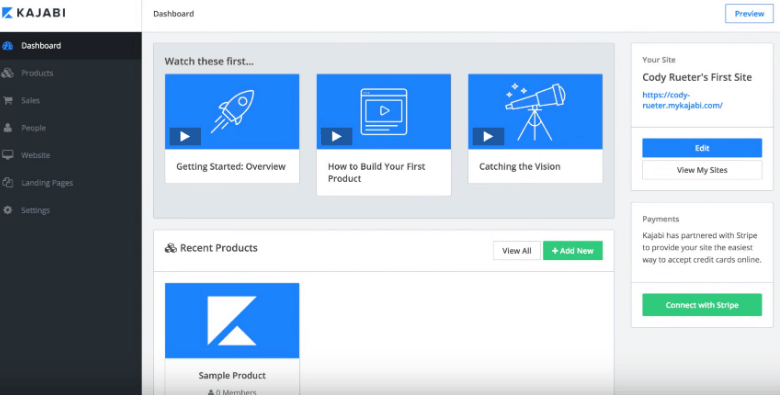 This is yet another useful tool that comes integrated in Kajabi, used to create a marketing funnel with a complete workflow for your products. This comes in handy when you want to sell eBooks, for example. The process is visual and automated, and you are guided through the building of a marketing funnel. Just drag and drop and build your workflow. No one else offers a process so simple, yet so effective. Kajabi has none of the clever features that you would with the top names in email marketing service, such as MailChimp. But it is still loaded with most basic functionalities to get the job done. There are no advanced features, but it’s nice to know that it supports broadcast emails, opt-in forms and autoresponders. It is also easy to create follow-up campaigns, as the interface is once again easy to use and navigate. Unfortunately, you will have to make do without tagging and segmentation options. The details for each of your members are kept in a simple record, where you can check every piece of data about that member. This includes their name, email address, received emails, and the list of items they have purchased so far. Another great advantage of an all-in-one app such as Kajabi is that all payments can be processed easily. There are many to choose from, including PayPal and Stripe. The latter allows you to accept credit cards over the internet. If you want to get into affiliate marketing, you can do so with a built-in programme. Just keep in mind that it only comes with the Pro and Premium pricing plans. You can even provide your affiliates with stats. As with other features on Kajabi, it is very simple to set up, run and manage. Kajabi comes with amazing customer support options. You can reach them 24/7 by email or live chat customer support. I've personally made use of this multiple times and always found it to be quick, friendly and answered my query with ease. LIke with all online course platforms there are multiple steps involved to get set up. 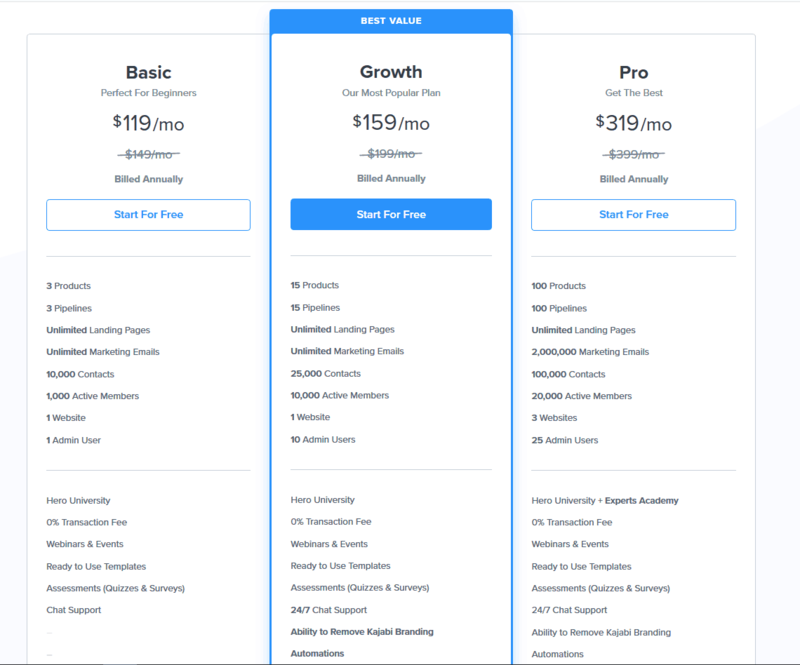 Compared to similar services like Teachable or Thinkific, Kajabi isn’t the cheapest – but you do get a lot for your money. Kajabi offers a 28-day free trial, which gives you a quick insight into most of the platform’s features. There are three different price levels. Basic – cost: $119/ month. For this you will get one site where you can have 1,000 active members, one admin user account, three different products to sell, unlimited landing pages, and unlimited marketing emails to up to 10,000 contacts each month. Growth – cost: $159/month. For an extra $40/month you can scale your online course up with up to 15 products and pipeline, 25,000 contacts, 10,000 active members. 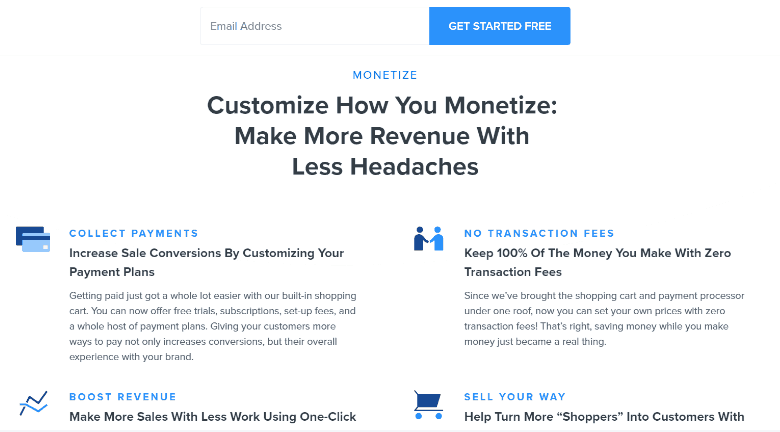 You also have the ability to run your own affiliate program and remove the Kajabi branding from the footer of your pages. Pro – cost: $319/month. This is designed for large online course businesses with big teams and many different courses. The Pro plan gives you three sites where you can have 20,000 active members, 100,000 contacts, 100 products and 25 admin user accounts. Whichever plan you choose, there are no transaction fees. All plans also include webinars, advanced tools for customisation, quizzes, use of all templates, drip content, training courses and 24/7 live chat and email customer support. Kajabi is an excellent online marketing platform which comes jam-packed with numerous cool features. With Kajabi you can design your sites from scratch, market them by targeting the right people and using simple and automated processes. It has such a rich set of features – more than any other online course platform. You can run your whole online course business on it without the need for a separate website, email software and landing page builder. This is what really sets it apart from it's main competitors like Teachable and Thinkific. Combined with this, Kajabi is very intuitive and easy to use, has beautiful themes and page designs, and offers excellent live support. This is why we use Kajabi in my other business where we teach people how to grow mushrooms, and it's why I recommend it as the most complete online course platform. If you have the budget for $100/month and want the most complete set of features, professional design, minimal tech headaches and top support – this is the platform for you. If you are on a tighter budget I'd recommend you going with Teachable instead. They also offer a high quality platform with slightly less features at a lower price.